Northwest Ohio's Premier Bridal Expo! Receptions may be big or small, lavish or casual. 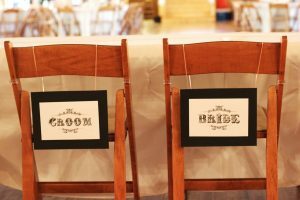 But regardless of their size or style, receptions all share a common element: They will require couples set up seating arrangement for guests. Even though assigned seating isn’t mandatory, selecting seats for a sit-down dinner makes things simpler and reduces confusion. Some reception venues may even require assigned seating so that catering staff can service tables accordingly. Seating guests can be tricky, but employing a few strategies can make the process go quickly and smoothly. · Use a seating chart. A seating chart, whether it’s venue-specific or one couples make themselves, is essential. If you using a self-made chart, inquire with the venue about the shape of tables, how many guests each table can seat, and the location of tables around the space. · Start with the wedding party table. Couples can ease themselves into the task of seating by doing the easy tables first. The primary one is the wedding party table. This traditionally can be a dais or a sweetheart table flanked by the wedding party. According to Martha Stewart Weddings, the table should be centrally located and the wedding couple should sit in the middle. A male-female pattern follows on either side of the couple, consisting of the ushers, bridesmaids, best man, and maid of honor. If much of the wedding party is already married, couples may opt to have the wedding party sit with their spouses instead of at the dais. · Organize family tables. Tables for parents, grandparents and immediate family members of the bride and groom also are high priority. Both families can be combined at one table, or they can be separated into two tables. These tables should be the closest to the bride and groom. · Consider mobility issues. Next seat guests who have specific needs at tables. Elderly guests may want to be away from the band, deejay or speakers. Guests in wheelchairs may need an accessible seat near the exit. · Get some help. Enlist the help of parents to seat their friends and extended family members. Parents may know best who gets along and who should be separated. · Seat dancers near the dance floor. To encourage dancing, place guests who tend to be lively close to the dance floor so others can see them getting up to dance and join in. Couples can use apps, lists or self-made charts to plot their reception seating arrangements. Create place cards or a central chart so guests can find their seats promptly and easily.